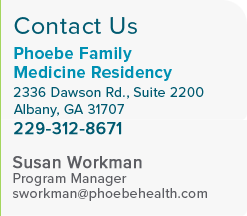 The Phoebe Family Medicine Residency program continuously addresses the shortage of primary care physicians in the region. Learn more about the residency program, watch our video. Our program currently accepts eight residents in each class for a complement of twenty-four residents. The program aims for the 60/60 rule, a goal that 60 percent of our graduates will practice within 60 miles of Albany. To date, we've met and exceeded that goal. 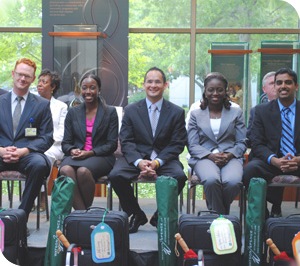 Currently, about 70 percent practice within a 100-mile radius after graduating from the program, and enjoy successful, rewarding careers in medicine. During the mid 1980s, the Georgia legislature recognized the need for more primary care physicians in Southwest Georgia and acted decisively to facilitate the development of a new Family Medicine Residency Program to meet that need. After a thorough review of the existing 38 county regional medical centers, Phoebe was chosen as the ideal site for this program. This well-established program has strong support from the hospital and the community it serves. The program seeks to blend the primary care orientation of a community hospital with the academic and educational resources of a world-class medical facility. Established in 1993, our program offers a rich opportunity for you to develop as a strong clinician capable of delivering high-quality primary care in any setting. Our world-class facilities make Phoebe a desirable location for residents to work and receive quality training.